Today is Lunar Eclipse Full Moon in Aquarius. It is the longest Lunar Eclipse in 21st Century. An Eclipse is when the Moon passes behind the Earth into its shadow. It only happens when the Sun, Earth and Moon are in alignment. It may feel like everything has been leading to this point. We are in a period of profound growth right now both individually and collectively. Growing usually does not come without change. Change often comes with resistance and fear. So this is about coming into your heart space to allow any shifts to occur in trust that it is for your greater good. How long have you been holding onto something toxic that no longer serves you? How long have you been going into the same old patterns? How long have you been acting out the same old reactions and behaviours? What are you waiting for? If you have not made a necessary change in recent months then it is likely you will have been pushed until you have no choice but to surrender. The energies are pushing us forward and helping these shifts happen at a rapid rate. It is likely that your shadows have been bought up to the surface in full illumination. Which can often be a blessing because we can become so blind to what may be stagnant and heavy within ourselves and our lives because we have been immersed in that energy for so long we do not know any different. It is often only when something falls away or heightens to the point that we have to let it go that we realise how much more space is created within, how much our vibration raises and therefore how much more abundance and flow we naturally invite into our lives. So this is a time to honour who you truly are. To remember that you are LOVE. You are Spirit in human form. You are here on Earth to learn lessons, grow and experience in its many different forms. When you can come back to Love it gives you the opportunity to remember what is truly important. The simple things. Connection. Love, Joy. Creativity. Acceptance. In this simple yet profound remembrance you are naturally drawn to change anything that may be holding you back and weighing you down because it no longer resonates, it no longer feels good. Whether it is something calling for change within yourself. Your diet. Your health. Your career. Your relationships. Your home. Your choices. Your path. Whatever it may be that is coming up for you and feeling uncomfortable then just make sure you look after yourself during this time as you work through it and most of all trust your own intuition. Energies are intense and there have been many physical changes occurring as well as emotional and spiritual. 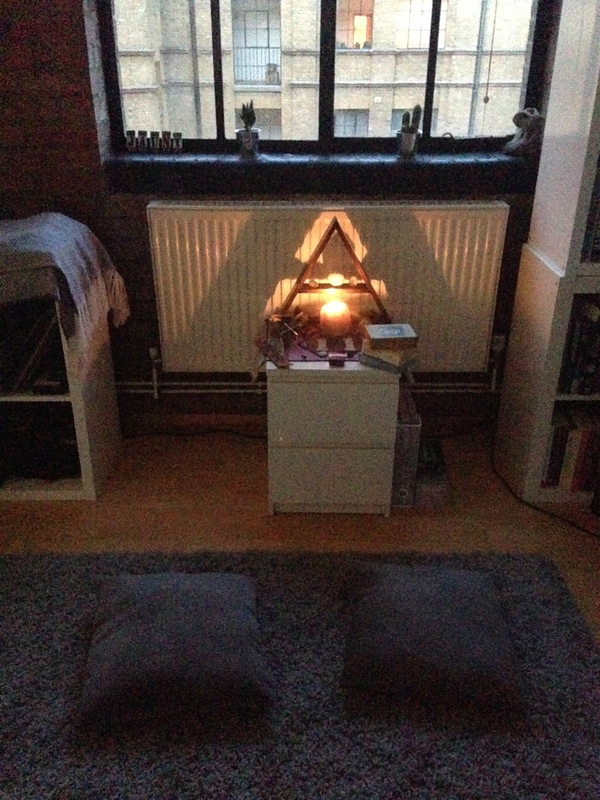 This has without a doubt been the most profound few months working with energy in the healing space. I have witnessed rapid shifts happening for many. I feel this is a reflection of the energies available to us right now. So tune into yourself. Hear what your body, heart and soul are communicating to you. Whether that is through physical symptoms, life situations or gut feelings. Take time to sit with the energy of the Full Moon Lunar Eclipse tonight to reflect on your journey so far. Reflect on what you have learned and how you will be moving forward. Remember you have responsibility for your own choices and therefore you can choose what your next steps will be. You are your own healer..
After a turbulent start to 2018 where many were faced with our shadows head on, it feels like we can finally rise up out of that intensity enough to breathe as we move into this new cycle. The energy has really shifted and it feels like all of the lessons, challenges and revelations experienced are making sense now as the teachings are settling into place and grounding into our reality. Have you integrated the lessons you learned into your life yet? As human beings we have a tendency to resist the truth even if it is slapping us in the face. We can go back into old habits because that is what we perceive as comfortable, when in reality its the opposite, it is the most uncomfortable as it is keeping us stuck in old vibrations. This has most certainly felt like a deeply cleansing time where ultimately we are evolving and raising our consciousness if we chose to follow the guidance and work through anything that may be holding us back. There is a lightness in the air now and a feeling of moving forward so you should start this new cycle with strong, loving intentions, holding a clear vision for yourself. There are no Full Moons in February so we can truly see this as a cycle to focus entirely on what we will be beaming into all the new space we have created after so much releasing in Jan. After we release stagnant energies it is always positive to focus our awareness on what we want to bring into that space. Create your own magic because you CAN. This energy feels as if it is shining a light on our dreams, making them feel closer, more attainable. Trust in YOURSELF. Trust in your unique, individual path and abilities. Follow YOUR heart. Be TRUE to yourself. if you are feeling uncertain about next steps then create enough stillness in your life to hear your inner voice. What is your soul whispering to you? On the flip side many will feel this fresh energy provide the sudden push they needed! So what are you waiting for? Go and get your dreams, no matter how wild and wonderful they may seem..
Usually January feels like a calm time of year. A period we like to spend in deep reflection for the year ahead, taking our time to settle into the new energies of the year. Focused on our visions, preparing for our next steps. it has felt SO much more than that this year though. I had a feeling things were going to be intense knowing that we were starting the new year with a Super Full Moon in Cancer on 1st January and closing the month with a Super Full Moon Lunar Eclipse in Leo on 31st January. The veils have most certainly been lifted in this powerful cycle. Raw. Confronting. Yet all for our greatest good. All in the name of LOVE. Bringing us back to our core. It feels like a real acceleration within our healing process if we allow. There is no doubt many have been thrown head first into old stuff the past few weeks. It has felt like another chance to see any cracks. Any holes in our career, relationships, environment and general life that need to be addressed if we want to expand. Many would have felt immersed into old patterns of internal or external self sabotage. A truly illuminating time as if a light has been shining into our darkest corners. Which area of your life has felt stagnant? Have you wanted to take action for a while but done nothing about it? If so then this stagnant energy has probably made itself known to the point of no return in the past few weeks, so that the ONLY thing you can do from here is move forward, because you feel it in your bones that staying in that vibration is not even an option anymore. Sometimes we are pushed to the limit but we can see this as a blessing. We can become so ‘safe’ in old patterns that do not serve us to the point of being blind to the harm and blocks they are creating within our life. It feels like it has been a deeply transformational year already which I know is not always an easy process to go through. It feels like the themes of this year are GROWTH and TRUTH. We all know that truth can hurt. Sometimes in order to live in our truth we have to go through a lot of change and GROWTH to get to that point. More and more I am noticing people waking up to their own magnificence. Realising their true potential and seeing just how important it is to be truly happy. No longer hiding from their soul purpose. Whether you are ready for the truth or to take action is another story but having awareness is enough for the process to begin. You may have had the sudden urge to follow your heart and take a big step whether its leaving a toxic relationship, moving home, leaving your job or going through a purification process to shed an unhealthy lifestyle. This year feels like a push forward to be in alignment with your true self. To be authentic because you simply cannot do it any other way anymore. Whatever it is that may be changing in your world just make sure you support yourself during this time. It will be normal to experience what I would call 'growing pains' during these changes. Just rest assured that self growth means you are expanding and moving forward, so whatever comes up in the process is all part of the journey and all relevant. Something that many forget to do which can be our biggest support during these times is to take time to be STILL. Slow down. Take a breath. It is in our stillness that we are able to clearly see or hear the truth which lies within our hearts. As we move through the transition of seasons from Summer into Autumn, we notice our inner world shifting too. I have noticed this seasonal shift hit many quite hard in terms of bringing up a lot of shadow to the surface. Shadow being the parts of ourselves that we do not particularly tend to embrace. For example, anxiety, fear, self doubt, anger. Autumn seems to remind us of the importance of balance between darkness and light. Natures cycles serve as a mirror of what is going on within our own lives. The darker nights and shorter days naturally lead us to turn inward. When we look within we are tuning into our inner self on a deeper level ready to do the work or at least begin acknowledging it. This is when we can become quiet enough to listen to what is going on inside and have true reflection. This is the time that we take all of the lessons learned from the past few months and put them into action. Shedding our skins and letting go of anything that no longer serves us. Walking into this new cycle with greater clarity and insight into our path ahead. What valuable lessons have you learned in recent months? Collectively we have been experiencing a number of powerful Universal shifts lately including the last Mercury Retrograde in August and the Autumn Equinox in September. As these Universal shifts take place we go through our own journey of personal growth too. We are ONE with Nature. We are so intimately connected and we must try and keep this knowledge present within us. By moving consciously through the cycles it means we can really embrace the flow and honour all that each season brings forth within ourselves. Whilst many of us may experience some resistance to this change of season as we leave behind the Summer, we must instead learn to embrace the gifts of this season too. As we watch the leaves fall from the trees it reminds us that nothing is permanent - this is one of the biggest lessons I learnt this summer. Life is an ever flowing journey, we cannot hold on to things but we can flow with it in each moment. I found the August Mercury Retrograde full of valuable yet extremely challenging lessons during my trip to Lisbon for my 30th Birthday. Each challenge served as a welcome reminder that all we really have is NOW. You probably hear this saying a lot right? Well until you really take notice of what that could mean in your own life it doesn’t have a lot of meaning. I learned this the hard way but I am so grateful for that. I would always try and practise being in the present in every day life but being a sensitive and emotional being, sometimes the emotion or reaction to a situation would get in the way. When something happens that is beyond our control it is always a good test for our growth. Look at your reaction to the situation first, rather than the situation itself. If you can remember this tool it can be one of your most powerful assets to keep you centred and in the NOW. Take a split second to ask yourself is this situation really worth my frustration or sadness? Or can I bypass the pulls of the dramatic ego and come into my heart space where I can take a balanced perspective at what is happening? If something has happened that your going to forget about in 1 week or even 6 months time why would it be worth your energy right now? If we remember that all we have is the present moment then we would not care for the past nor the possible future outcomes, we would be in a state of acceptance. This would mean saving a lot of wasted energy and time as we CHOOSE to react to the situation from a apace of balance and more importantly TRUST in all that is. Events can change. Plans can be disrupted. People can let you down. The only thing you can really control is your own perspective and reaction. So why not own it? Its challenging work sometimes but so worth it! We can find lessons in everything and grow from every situation if we want to. Lets look at the first Reiki Principle - Just for today, I will not be angry. Anger is consuming on so many levels and it can be super fast, rising up within us like fierce, raging fire BUT what if I said you had a choice? What if you tuned into that anger, listened to it and tried to really understand why it is actually there in the first place? You may always have certain things that trigger anger, but it is how you deal with it when it does come up that matters. You can chose whether to stay in that low vibrational emotion and hold onto it, or you can chose to let it go and feel peace instead. Anger only creates further blockages, so staying on top of it by looking at it with a whole new perception is a really positive tool to help keep your energy and emotions more balanced, flowing and free. I spent most of my life bottling up my emotions and feelings up until the last few years, which also meant I hardly ever expressed any anger as I just wanted everything to be OK and to be strong (although I did not see that being strong is actually being authentic and open) this meant I had a huge amount of pain to release which would come out as anger whenever I was caught off guard, like if I had alcoholic drinks for example and it would unleash tears and words which I had never had the courage to say before. When I did begin to look deeply into myself without toxic substances in the way, then all of the blocked emotions that had built up over the years came out strong and without any control at times. However, my willingness to look within and face all of the pain and emotion in which I was fully aware was at the very root of any anger or fear, made the process more bearable. It is safe to say that from the moment I began to tune into energy and become aware of my healing abilities, is the moment when I really tuned into my true self and was able to see myself outside of my ego. It is so unhealthy for our energy to keep things in and we are not living in our truth or in our power if we are not being authentic in our feelings and expressions! I spent far too long pretending I was OK when I wasn't and this really does have its consequences in so many ways..one of the main things to remember is that these buried feelings will not simply vanish one day, they are within our cells and they can manifest as anger, resentment or even physical ailments if not looked at. Reiki is a very powerful and beautiful way in which we can release these pains and blockages we may be holding onto. So, next time you find yourself in a place of anger - take a moment, breathe and look at it closely.. look where the anger is really coming from because it will always be coming from somewhere else, sometimes a very deep place of pain which has not been healed or sometimes because you are actually very worried and have a lot fear about a person or situation for example. Try and understand where it is rooting from, even in that split second. Once you do this more frequently it will become more of a natural response for you and it will be easier as each time you are choosing not to substitute an emotion with anger! Anger is only a temporary cover up and it actually prolongs things, rather than actually facing the reality of what has caused it. If you are in a situation where another person is acting in anger; instead of reacting back with anger on top of anger, try and look at that person with an open heart and see that they are an individual being too with their own pains and problems, so maybe there anger is coming from one of those places, just as it does with you in your own individual way. Pair anger with empathy! Once we begin to view anger in this way, each time it arises within us we can conquer it quicker and in turn this will lessen that reaction in us over time, and if we are ready to face it we can go to the foundation of that anger in each situation that it may arise if we want to, we can go to that deep emotion that needs to be looked at and faced, as it just keeps coming up again and again which is why it is now manifesting as anger; this could be jealousy, abandonment, loneliness, feeling unloved, loss for example. In my personal journey with looking at my own anger on a deep level, after working through releasing the old emotions and blocks initially, I realised that if I ever felt anger within me that it mostly came from my own self-esteem issues but also due to the fact that I too often overcare in certain situations. Overcare is really deceptive because although it comes from a place of love and compassion, it basically turns a caring thought into a worry, frustration or anger! For example, when my partner does not feel well, I worry so much I find myself in a feeling of total fear and stress, purely because I love him so much that I just want him to feel good, but what good does that really do... Does it help him? No. Does it help me? Most certainly not! It actually does no good in the situation at all other than causes extra stress! So, if you are a hyper sensitive and empathetic being like me and you care about everyone and everything a bit too deeply, try and work through that and come on top it by using tools which work for you, get yourself into a heart space where you can have compassion and appreciation without the worry or stress. Do not ignore anger or sit with that feeling, instead see it as something to be thankful for, as if each time anger arises it makes us take a moment to understand ourselves or another person on a deeper level then we can chose to replace anger with forgiveness, we can chose love. This is not about being a 'perfect' human being who does not get angry, its about tuning into our energy and our emotions and creating a greater awareness of self and others, understanding on a deeper level so we can feel better in ourselves and feel HAPPY! The willingness to look within and go through self-work to develop, grow and heal is the greatest gift you can do for yourself.. self awareness is key! As I sat there on my bed staring at my laptop screen pondering about what I was going to write about in my latest blog last night, I had so much going round in my mind which I wanted to share in the hope to help, enlighten or inspire others, but nothing felt right.. I believe writing should come from the heart so it flows and is from a place of truth, as then the reader can usually feel that in their heart and soul too, so I never want to force writing. 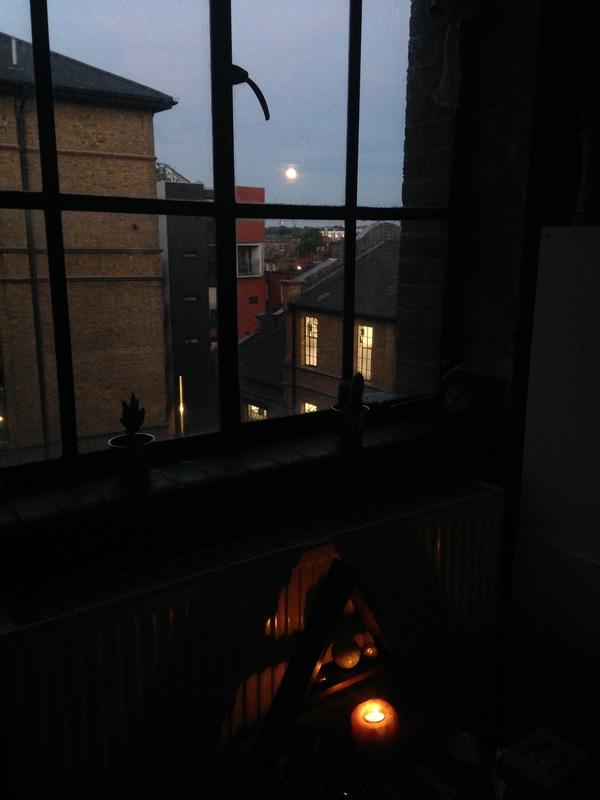 So anyway, as I sat there pondering, suddenly my eyes were diverted to the window ahead of me and there I saw my inspiration instantly - an almost full moon stared back at me - aligned perfectly within the small slot of window showing at that perfect synchronistic moment, I smiled to myself and said thank you to the universe for showing me. Over recent years I have developed a strong love for the moon and have felt very connected to her. I am no expert in the moon but it simply fascinates me with its beauty and power and the way it has effected me over the years has been overwhelming at times, but also knowing that the moon energies are the catalyst for these emotional and behavioural changes always gives me a sense of contentment and trust..trust that it is all necessary and to just surrender to it! The idea that the moon phases can affect every living thing on our beautiful planet goes way way back.. and if you think about it, most people are aware that the moon effects the tides; which are created because the earth and the moon are attracted to each other like magnets, and so the moon pulls at the earth but the earth is able to hold onto everything except from the water… so it makes perfect sense that us humans are affected by the moon too because we are made up of approx 60% water! The word 'Lunatic' is actually derived from the word 'Lunar' which is the latin word for 'Moon'! Even long ago it was believed that the phases of the moon effected peoples minds and behaviours, especially people with vulnerable or sensitive minds apparently. Its funny because I always remember my mum telling me that the residents in the nursing home she managed often acted differently when it was a Full Moon, she would say they would be unable to sleep and were very unsettled. When researching I even found there was an announcement from Senior Officers of Brighton Police back in 2007 where they explained they were planning to get more officers in to help with trouble which they felt was linked to the lunar cycle; they had carried out their own research which showed evidence of a clear connection between violent incidents and full moons! It really can bring things which we may have been pushing to the back, right up to the surface, whether we like it or not! This is why I want to try and spread some awareness of the Full Moon, it is beneficial to have the moon phases noted in your calendar so you can be aware of the energies and how they may influence your emotions, impulses and feelings during certain times of the month. Of course there are many phases of the moon, but today I want to focus mainly on the Full Moon. There are many books out there which can give real insight into the ways in which you can go with the flow of the moon cycle, helping you get into the natural rhythm of the ever changing energies it brings. This is something I am beginning to research into only now, it feels the right time now I am at a grounded point of my life. The moon energies and shifts can leave us feeling frustrated, low and confused at times if we do not understand it, so to flow with the cycles and not fight it can only be beneficial! I guess it is just tuning into mother nature on another level too, a deep level because this is all about our emotional inner self. The relationship between water and emotion is well known throughout spirituality too so I guess this is something else which supports this Moon/Water/Emotions connection theory. The Full Moon is the phase where the lunar powers are at their maximum, so we may feel more in tune with our instincts and have more intense emotions during this time, it is also said that the spiritual world is at its closest during this time too. I have found that the week running up to a Full Moon is usually a strong contrast in feelings for me. For example, I generally have a calm energy, but I notice I begin to feel a little irrational and emotional about a week before the Full Moon and I am faced with what seems like every aspect of my shadow-self, you know, the dark bits which we all have in different ways, collected from childhood and all other experiences from along the journey that is life. So basically all of my deepest and darkest thoughts, fears, low vibrational emotions and weaknesses, yep, all of that dark stuff seems to come up at some point whether for a split second or for a day or a week - the moon has her way of bringing the unconscious into consciousness. However, after being on a self-healing journey of transformation and self-discovery for some years now, I am totally aware of my shadow-self and it is something I am constantly working through, one bit at a time, getting deeper and deeper and releasing more at each step of the way, so it no longer alarms me when it all comes up during these times and I actually welcome it, I am grateful for it as it reminds me what work I have to do on myself and what parts of me I need to learn to love and accept, but also of how far I have come too, recognising the parts of me that have been healed. So the contrast I spoke of before is because although I seem to notice this darkness springing up more intensely during this phase, it is totally contrasted with the most incredible feeling of completeness.... I say this because I notice such a shift in energies when doing my healing work running up to the Full Moon. Last week for example, a lot of my clients who came to see me said that the healing energy they experienced during the session was the strongest they had felt in an energy healing before, and I felt this from my side too, it channelled through me with such power and I really felt like an open vessel. Every healing session felt like an energy operation where I was able to go deep into the chakras and energy body with my hands, releasing old pain bodies and working through imbalances bringing the energies back into alignment..even just as a channel for these healing energies I felt so in tune with every second of the healing, and I really feel like the moon had shifted something to make room for deeper and further healing work for those who come into this healing space! So along with the darkness which she can bring up in this full phase, she can also bring magical and mystical experiences too, its all about the balance! I had some really interesting experiences with the moon last year in regards to my menstrual cycle - I noticed last spring that my menstrual cycle began on the same day as the Full Moon, I had not noticed it before so I noted it down each month thereafter and to my surprise it came on the exact day or the day after each Full Moon. When I looked into this to see what I could find online, I was actually pleasantly surprised to find lots of information about the effects the moon has on our menstrual cycles. I found research everywhere to suggest women who bleed with the full moon are the medicine women, healers and the mystics and this is called the Red Moon cycle. A woman of the Red Moon cycle is said to bring her healing and magic into the world and focus her energies on empowering and enlightening others rather than giving birth to new life, she delves deep into the darkest corners of herself to heal, in order to then focus her energies on the rest of the world. Then the women who bleed with the New Moon and ovulate during the Full Moon follow the White Moon cycle. It is known that the earth herself is most fertile in the light on the Full Moon and research supports this as there are many studies showing that when seeds are planted during a Full Moon, the crops are the biggest, just the same as a women who is ovulating during a Full Moon will be at her most fertile! A women of the White Moon cycle is known as the mother, the nurturer. I also read that our cycle can change when our life circumstances change, and this soon became apparent to me - In April last year I bled with the full moon on 4th April, as usual, but then around 1 week later on 11th April I had my first Kambo ceremony with one of my closest friends Shardai (Shardai holds a beautiful, healing space for her powerful Kambo ceremonies) I would love to talk about that experience another time as it changed my life, but one thing that did happen after the ceremony was my menstrual cycle changed! A few days after the Kambo ceremony it was a New Moon on 18th April and I was surprised to begin bleeding again when I woke up that day, given that I already had my period a couple of weeks before with the Full Moon. I put it down to the Kambo ceremony as I knew how much had shifted and purged out of my energy and body during the ceremony, so it did not surprise me too much if things were releasing in the physical sense too. However, the next month I did not bleed with the full moon as usual, I figured my cycle must have actually changed to go with the New Moon and I was right as on 18th May I began my cycle with the New Moon! I actually felt a different to when in the White Moon cycle rather than the Red Moon cycle, I felt more energised and flowing and I noticed my skin and body felt different, I liked it actually, I guess for whatever reason I was ready to be in that cycle for that time and I stayed with it until a couple of months later when I moved to Ibiza for the summer…..I arrived in Ibiza in July and I had my cycle with July's New Moon as expected, but then at the end of the month on 31st July I bled again with the Full Moon! So this meant I had now had 2 months that year that I had bled with both moons in the same month! I would love to hear about your Moon connection tales, please write on the comment section below if you want to share, I think it is really interesting and empowering to be able to share this kind of things with each other as fellow women!!! Myself and a close friend will be creating a sacred space to hold New Moon and Full Moon circles in Dalston, London soon, I will post all of the details up on my page once they are confirmed. The Science Behind Energy Healing.. I am SO HAPPY to see 'HSP - Highly Sensitive Person' is becoming more understood and researched into! Its about time this was taken seriously in society as awareness really is essential.. this is a very real thing that effects around 20% of the population and I expect many people like myself, who are HSP's have only just found out about this trait recently! I feel so grateful I did as the research and advice around it can really help you learn how to protect yourself and ways in which you can deal with certain situations if you are, and also just to know that you are not alone or going crazy too. I would strongly suggest anyone who thinks they may be HSP to firstly look into 'Eliane Aron' who wrote a book on being a HSP which saved me in really dark time a few years ago when thinking no one else understood the intense emotions and hyper sensitivity I was experiencing in day to day life, but now I can turn it into a positive thing thanks to the work of Elaine Aron and other HSP support groups online which gave me deeper understanding and advice! Its great for your partner or friends/family to read too if they want to try and gain insight into the world of a HSP! Her website is http://hsperson.com/ which also has details of the book! The Universe ‘synchronisticaly’ bought METRO journalist Amy Dawson into my therapy room last week.. Amy asked me questions about Crystals and Healing and in particular the ‘trend’ in Crystals.. Crystals are so close to my heart as they played a KEY and vital part in my own awakening in 2010, as they did an array of my close friends, so I was more than happy to express my views on this subject! I made my point that this is not a trend, but an expansion in consciousness! Our discussion is part of Amy’s article where she explores her own beliefs... Read the full article on Page 33 of METRO Paper!!! !